I’ll keep adding to this list as I carry maps out the door. Check back! And as I said before, I’m happy to send a couple in the post if I haven’t made it to your neighborhood yet — or even if you’re out of town. Just send me an email with your address. The bike maps are coming! the bike maps are coming! Shout it out your windows, from the rooftops, the bike maps are coming!! Dear lordy I spent too much time on this project. But they’re here! Well, I have a handful of them as I write this, the rest of my little pannierful having been handed around the UC Geography Department this morning. Sometime later today or tomorrow, I’m taking delivery from the printer of two pallets of boxes, together about the volume of a loveseat. A loveseat of maps. Eventually all of these boxes will leave my little apartment, which has no room for a loveseat, balanced either on wheels or feet. They’ll find their way out into your bicycle shops, your bars, your universities, your coffee parlours, your city, your chambers of commerce, into, I say, your very souls. 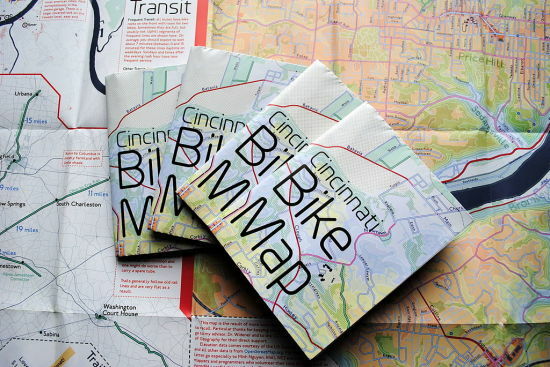 If anyone wants to save me the effort and accept some bike maps right now before I come knocking then throwing bike maps at your bedroom windows in the middle of the night, I’ll be very glad to deliver or ship, depending on how close y’all are. Just send me an email with your name and address and how many you want. I can send one just for you, or a whole box if you want to hand them out to your customers, cycle club, etc. Shipping or delivery is free! These are free bike maps! And there are plenty enough to go around! Please do not hesitate to ask for some! Get extras. Take some into the office. Take some to your church. The next time a bum asks you for bus money, hand them a bike map and say: Haven’t you heard man? Bikes are the thing now! 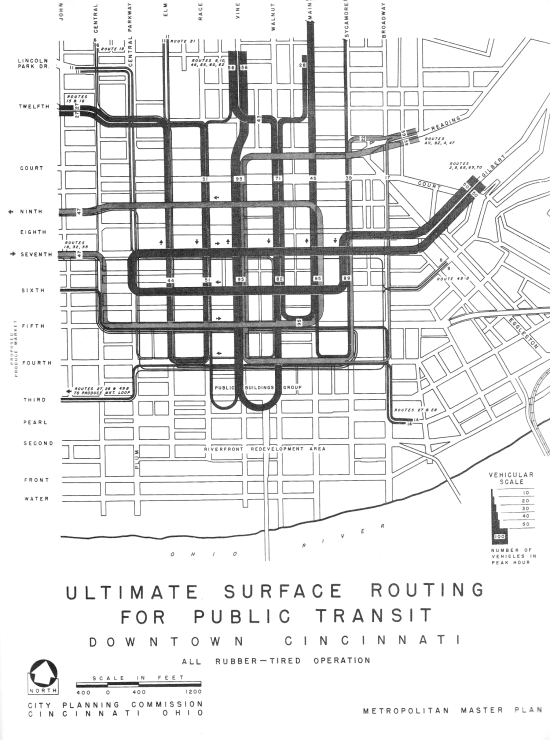 I asked if he’d mind if I hosted the documents online for y’all to peruse and he said he’d have to check with the CTHA first…but in the meantime, I can post a few teasers: some random pretty maps from the 1948 Cincinnati master plan. Dave, you have my thanks, and for the rest of you, hopefully you can look forward to seeing a lot more of this stuff soon! It’s amazing to see how much and how little some things have changed in the last 80+ years. 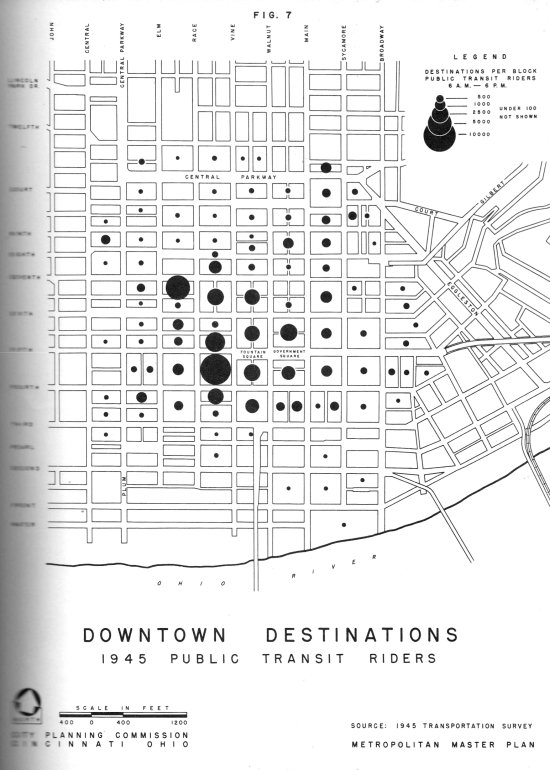 Hopefully I’ll also be able to pull some useful data out of the maps and schedules (beside just drooling over the thoughtful pre-GIS cartography). Also, I’m planning to attend the next meeting of the CTHA, if anyone wants to join me and (make me) not feel like the only new person there. It’s Saturday May 17th, 7:30pm at the Queensgate Garage. Come on out! That project gets all the money from the sundae sales, plus a match. This marks the start of my fundraising efforts for the Cincinnati Bike map, a project I haven’t mentioned much here in a while, but which I’ve been working on intensely for the last few months. Below is a snippet from the legend just to whet your interest. I’ll leave a detailed description of the project for another time(I’m writing a paper on it now), but I hope you’ll join me this Sunday to find out more and support the project! The release of SORTA’s real-time location data has been delayed again, this time until April 20141. Originally scheduled for sometime around this past December, the system upgrade that’s necessary for the public release of the data was apparently tied in with capital funding for the streetcar. That funding was of course delayed by shenanigans. A reader just passed this article my way and I can hardly do a better job of explaining why real-time arrival data is important for growing ridership on our transit system. This recent cold-punch-in-the-face weather has emphasized, for me at least, just how long waiting can seem to take when the bus is nowhere in sight. The release of this data should be a major priority for both agencies which already have the necessary systems installed on most if not all vehicles and just need to get the appropriate back-end systems in place to handle web requests. Apologies for the slow posting here lately…grad school has been swallowing an outrageous amount of my time the last couple of weeks. I do have some interesting things in the works though, so I’ll just whet your appetites until they’re ready to fruit before leaving you with some methodological musings. My first semester as a geography grad student is finally over! I haven’t picked a thesis topic yet, though I do have a feeling it’s going to have a lot to do with cartography and transportation when it comes. 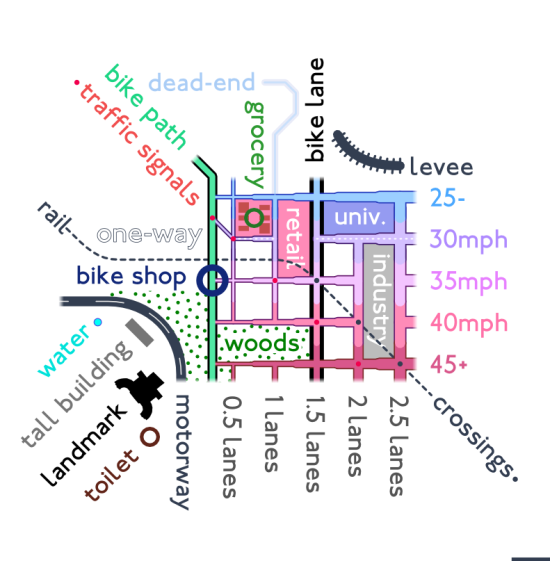 I’ll be TA-ing Human Geography next semester, and using some (formal, advised) independent study time to further develop a bicycle map concept. So, about that bike map… after three or four months of teaming with Queen City Bike, they still hadn’t pulled together enough money to make me feel confident that the project was going to happen. $500 in four months is not a great start when I was shooting for $5,000 in the first! I’m currently, slowly looking into grants and doing everything I can to avoid having to do all the fundraising personally. As much as I enjoy talking with each and every one of you and asking for money, I learned from the transit map project that doing that puts too much of the burden of keeping the project alive on me. I’d really like to make this next big map project into something that keeps going for more than a couple printings and if that’s going to happen, I need someone else to seriously invest in it and care about it’s continuing success. My poster topic, and the biggest devourer of my recent time, is a quantitative analysis of total access in several stop-spacing and service frequency scenarios. It’s my intention to prove(or disprove) that people, at least in the short term, would have better ‘access’ if SORTA abandoned their ‘BRT’ plans and simply added service to existing lines and got rid of some low-ridership stops. You’ll hear more about this here when it’s ready. But I may also blame the slow posting on a rapidly developing understanding of my approach to such problems as the ones I’m trying to address through this blog. 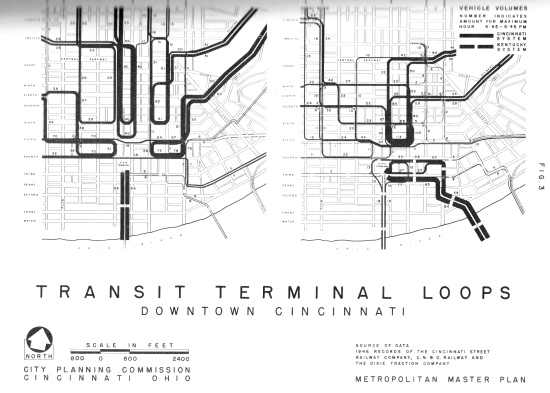 My rational side says I need to be positive and empirical, adding nuance and evidence to the general discussion of transit in Cincinnati, but the less rational sides of me want prankishness and a negative reproach to the nonsense I see going on all around me, particularly about ‘the streetcar’. As much as I want to tear down the populist John Schneiders and John Cranleys I want to take the high road and pretend that I might thereby climb high enough to avoid them. But would I then still be able to see the ground to which I must ultimately return for food and shelter? I’m torn. I wonder if a positive approach which strives for intellectual rigor first is more than an acknowledgement that practical political change in Cincinnati is hopeless (in the short term at least) and that my personal prospects lie in a different context with different values. Am I seeking validation from a group of elite critics and experts, popularly ignored, or actually trying to change a system largely run by demagogues and their uninterested employees? Is a synthesis possible?